The term ‘To order’ ,‘To the Order’ , ‘To the Order of’, ‘ To the order of Bank’ – These words are rarely used in Invoice also other than bill of lading, to hold the title of goods in exports and imports. 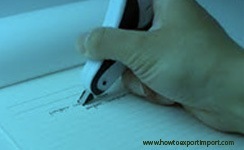 Most commonly, invoice is consigned to the buyer whose name and address is mentioned. However, under Letter of credit instructions, such words are used to hold the title of goods to bank. 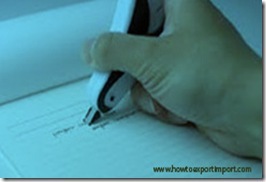 If the consignee XYZ who placed purchase order with overseas supplier wants to deliver the goods later to some other party either by re-selling or transferring goods, the consignee instructs overseas supplier to mention consignee column in Bill of lading and invoice as “To the order of XYZ’. In this case, once after arrival of goods at destination, if XYZ wants to transfer the goods to ABC, XYZ endorse Invoice and Bill of lading by signing back side of original bill of lading by mentioning “Please deliver cargo to ABC….” Or equivalent words. Although the term ‘To order’ ,‘To the Order’ , ‘To the Order of’, ‘ To the order of Bank’ are used in the consignee column in Bill of Lading commonly, such words are rarely used in Invoices. sandip patil: On 12 February 2015 I am very happy to say that your website has very good data to learn and I have learn my initial export career with help of your good website support I am working with 2 years at merchant exporter I have query for shipping bill consignee name shall we take dummy name for de-fecement of original customer name? or shall we take customer's bank name in consignee at shipping bill? Admin: On 12 February 2015 Hi Sandip Patil, Mentioning dummy name as consignee is wrong. However, there are different methods to hide the actual consignee in international business. Mentioning bank's name in consignee column or mentioning 'to order' as mentioned by you is practical. You may consult an expert. Arpit Gupta: On 18 February 2015 I have imported few goods for commercial purpose and made the payment of 1430$ (through wire transfer) to my supplier. My supplier has send the goods with less invoice value (800$ only) and it had cleared Indian custom without any objection. I have never asked my supplier to generate the invoice for less value.The accessible value custom taken into account it 800$ and calculated the duty based on it.My question is how can I handle this case ? Should I submit the additional duty to custom ?in case of audit this will turn out to be a fault on my side. Anil Banwani : On 16 August 2016 I m from gwalior(m.p.). I had exported container to Bangkok of agri commodity. as the consignee name is TO ORDER and notify party name is mentioned in BL. But dispute is that party Is not ready to take stuff as market is down. So how I get my container back or switch BL to other party. Brijesh Patel: On 13 February 2017 how to receive payment under letter of credit mention of "to order" in commercial invoice ?